This project will create a customized multiboot XP Install DVD. I hadn't tested on a folder with spaces on path name before uploading so it might be buggy - solution - use a path like "c:\uxp"
This project will take around 30~50 minutes until it is completed - all steps should be done in complete unattended mode without requiring any user interaction. The download package is sized in nearly 600Mb because it includes all driverpacks available and around 300Mb worth of freeware applications - it wasn't meant to be light - just a big and heavy XP install that I could use for everyday OS install on new machines without need to worry about drivers or installing some of my favourite programs. This project allowed me to build a 1,4Gb XP Install DVD that I burned onto a 8cm mini-DVD/rw and carry everywhere to use whenever needed. Please remember that this is the initial beta release and I would really appreciate any feedback regarding this project in order to make things work better - thank you in advance for your comments about it. 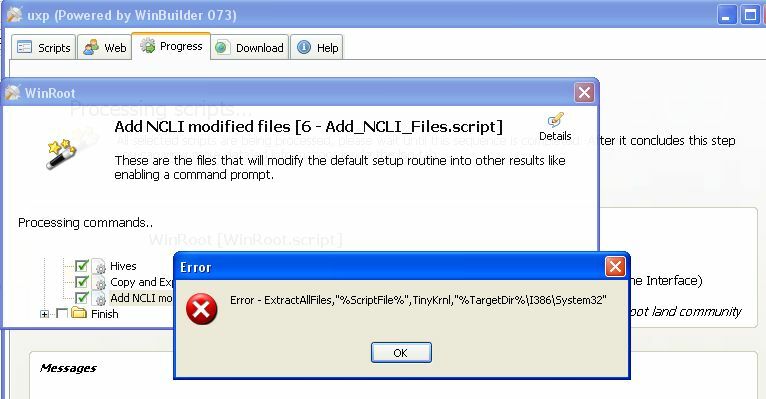 Please use new Add NCLI Files Script. Cool project. Havent tested yet. What are youre impressions of the results you got from youre testing. I also wanted to mention that you will probably need NET Framework installed to be able to run Nlite. I think that is one of the requirements when I last tested Nlite a while back. LiveXP boots and works perfectly. You can try installing the setup routine on the virtual machine - it includes a virtual disk and takes about 20 minutes to install the OS. Read the long intro. Better having info so the user is asured the quality of project then not having it. Going down the list of scripts. First error popup. 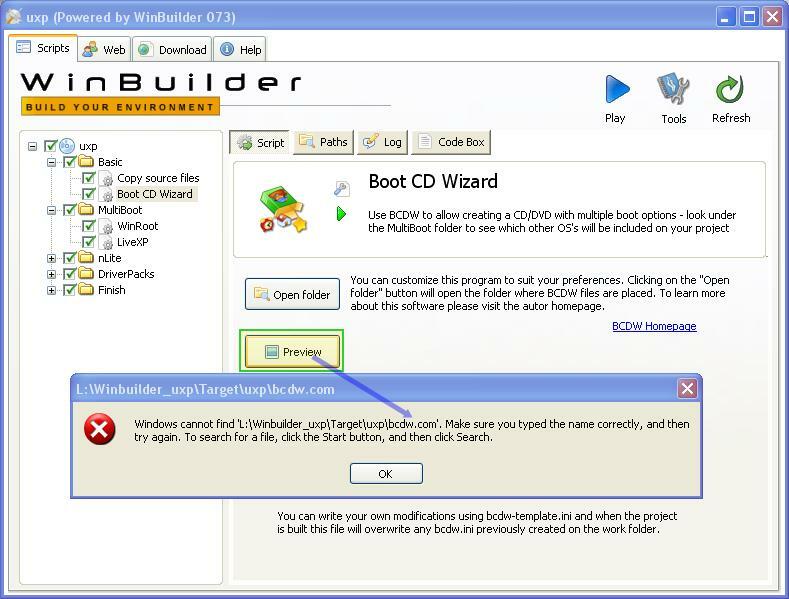 BootCD Wizard - When pressing the Preview button, it cannot find the bcdw.com file. Im guessing because I have yet to run the Project. The Target Dir is not built yet. Havent runned the project yet as stated. I Pressed Play. 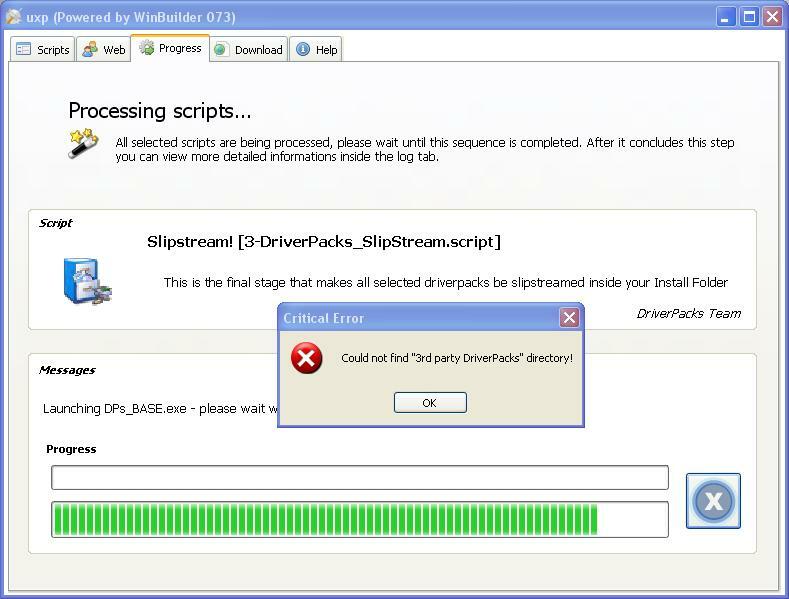 It gave an error when it hit the 6 - Add_NCLI_Files.script I replaced. Have to go back to try original. Original 6 - Add_NCLI_Files.script seems to work. Waiting for project to finish Building. When nLite came on. It asks for the source files. Im guessing what it says is the write directory for the source. When are the drivers pack installed or are we suppose to use nLite to integrate them. Hit the next button on the Drivers part. Created ISO, booted in VirtualBox. If you copy the i386 folder by hand before you start the project and disable the copy script, nlite will not bug you at all but run fully automatic. Nuno, hi!! --updates, all right!! maybe you would consider using/inspecting my 'nLite Reduction' script? It was place on the bartpecore server, but actually was made with several projects in mind, this was one. You can just place it anywhere, changing the level as needed. So umm.......whatever happened to this project? Does it work right yet? is it possiable to customise the boot screen? Is this project working ok with you guys? If so, then I would remove the "beta" label since we'd have a minimally stable workground. Will do so if there is enough demand for an new version upload. After you build the project for the first time you should be able to find a file called "splash.gif" and replace it any other image you like better - your files that will be used to build the ISO image should be placed inside a folder called "Target". You can also replace this boot screen image with animated gif's if you prefer. The filename can be changed to anything else you need inside a file called BCDW.ini and it also supports JPG files. When you're done - open winbuilder again and select the script called "Create ISO" that is placed on the Finish folder. Click on the green play button to run this script and this should produce a new ISO with all your changes. -- Let me know how it worked out for you..
Out of beta tests (finally)..
i'm having an lsass.exe error when running the livexp....? 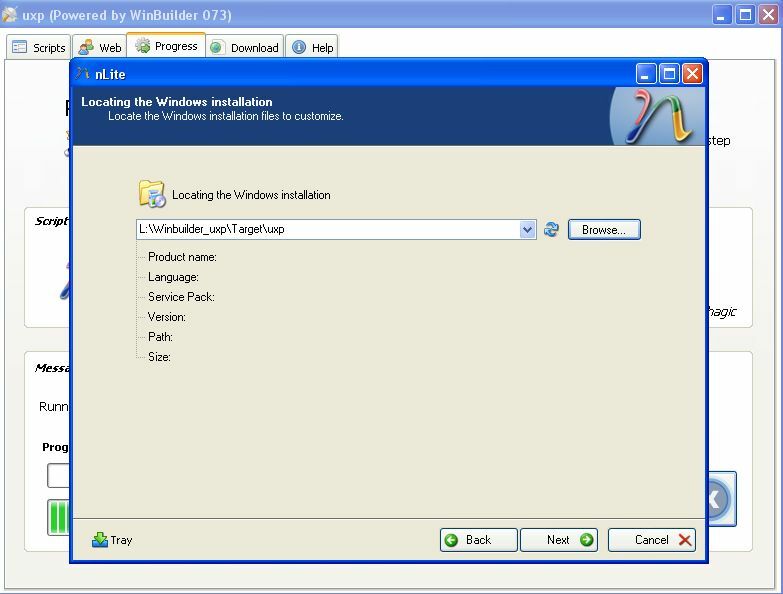 What about a domain for UXP, like uxp.winbuilder.net? Only contains the project files, hadn't had much need for an introduction page but if you're interested in creating one to be placed as http://uxp.winbuilder.net then you're surely welcome. I'm also looking for people interested in creating the next version of UXP, at the moment I've already added Parted Magic, WPI and I'm just finishing up the liveXP portion that needs some tweaks. If you want to be part of the work team for developing this project, do let me know!! 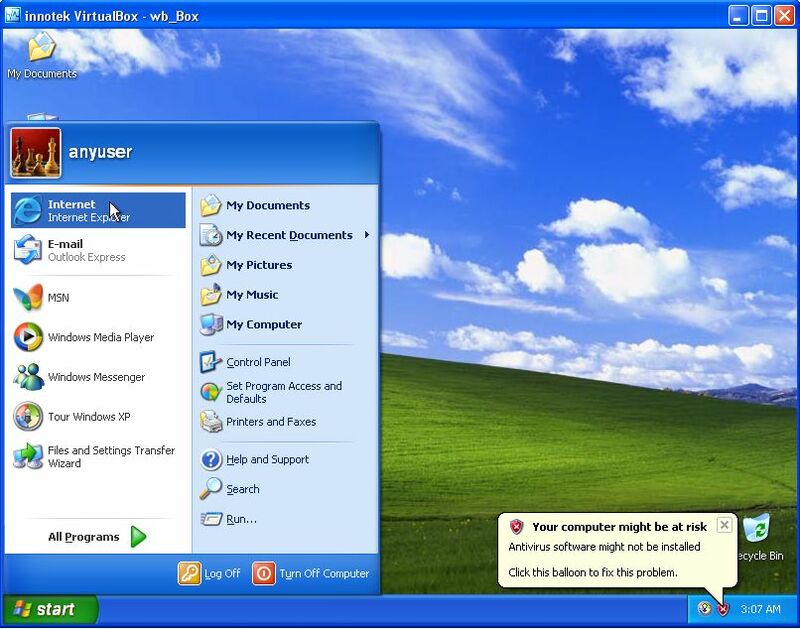 xp boot. ill be interested to see when i get home what the outcome is. everything to that point had run like clockwork after i added the folder 3rd party DriverPacks to the DriverPacks folder to kill the error "cant find 3rd party DriverPacks" during DriverPacks scripts. Glad you're liking this project. I've also solved those annoying quirkes this morning. I'm just testing on a Vista machine and will upload even today a new version that works better. Haven't tried it but I hope it works as you expect. sort early boot files in front of media. Early booting use BIOS calls. 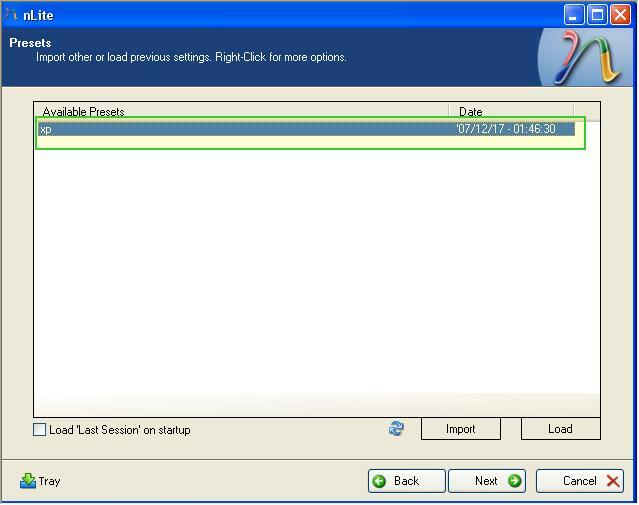 Some BIOS limit CD/DVD access. Only first part is available: first 65535 sectors or first 2GB or first 4GB. E.g. setupldr.bin or BIOS acesss first 4GB only. Setupldr.bin won't find a textmode file at end of media, at 7GB location. Hole DVD is available after loading and starting CD drivers, e.g. cdfs.sys. Why do we have to download such a huge deal? Can't we build it like a project?